WesSpur’s climbing kits contain everything you need to get started with a spur climbing or rope climbing package. On this page you will find upgrades to take your kit beyond the basics. Check out the coupon at the bottom of the page to add other items to your spur or rope climbing kit and get a great discount. This upgrade for your spur climbing kit gives you premium rope and hardware to setup Moving Rope System. With this add-on, you can maintain the two points of connection required to work safely in the tree. The Moving Rope System can be used to enter a tree you are not spur climbing, as a second point of connection when climbing, and to exit the tree quickly and smoothly. 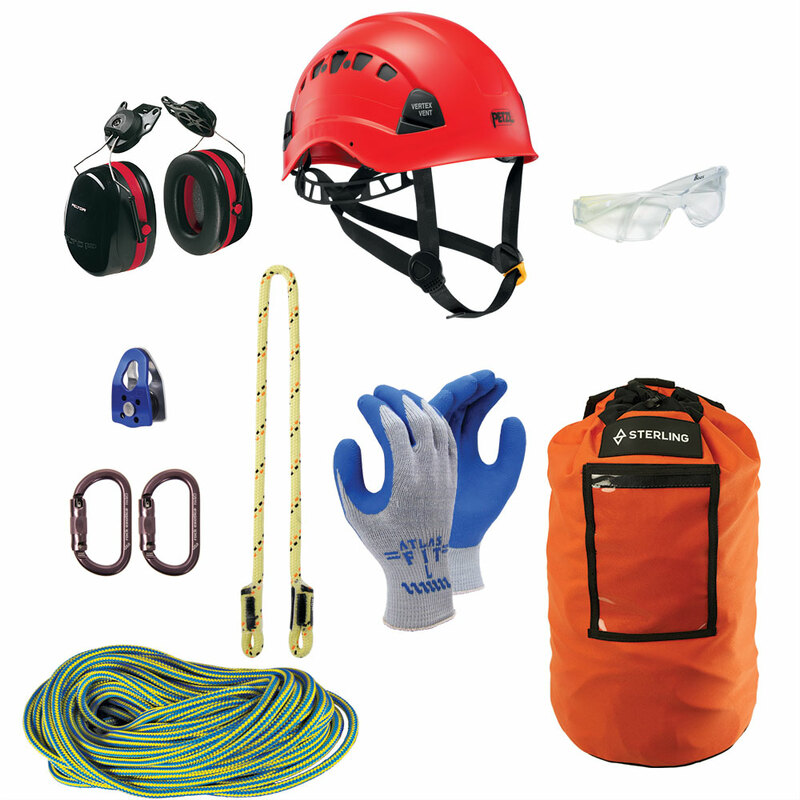 This kit provides a climbing line upgrade that can be used as described above, and also includes essential safety gear for working in trees. Contains: 150' ArborMaster® Bigfoot climbing line, friction hitch, hitch-tending pulley, figure 8, rope bag, Vertex Vent Helmet, Boas Safety Glasses, Atlas Gloves, and helmet-attachment ear muffs. This upgrade to the rope climbing starter kits enables the user to climb in the Single Rope Technique (SRT) using ascenders. This is useful for long ascents. With the gear in this kit, the user can set up a system where the climber alternates between standing on the foot ascender and the foot strap. Alternating in this method makes climbing the rope a lot like climbing a ladder. Kit Contains: CMI hand ascender and foot ascender (choice of right or left), ascender foot strap, delta link, standard figure 8, and 7 feet of Sterling 8mm cord that can be used to tie a prusik. Contains an extra-long Icetail prusik for footlock climbing. Also contains Pirate carabiner and standard figure 8 for rappelling back to the ground. Standard length of footlock prusik is 40" to the eye. Also available in 38" or 42" by request. 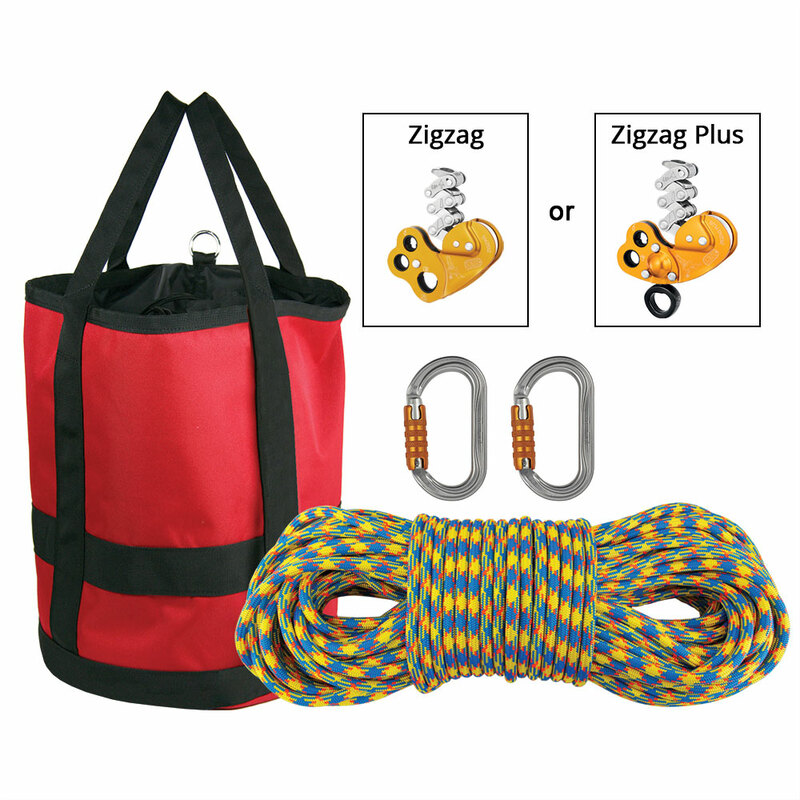 This kit combines your choice of Zigzag or Zigzag Plus with carabiners and spliced climbing line so that you can get a professional climbing system in one convenient kit! Oval Petzl OK Triact carabiners are ideal for moving-rope systems, and Velocity is one of the most popular climbing lines, lightweight with great handling and durability. This kit comes with a medium rope bag - keep it ready for instant deployment. The Rope Wrench grants smooth, precise control to the climber, and is an excellent tool for working the tree in SRS, saving time switching between SRS & MRS systems. All the hardware you need to experience the Rope Wrench is in this kit. You'll want to have a way to tend the Rope Wrench. A trick using gear you already have is to run a lanyard over your shoulder and clip it into the Hitch Climber. Kit contains: Rope Wrench ZK-2 (ASC179), Stiff Tether (ASC196-O), Phlotich Pulley (PUL160), Camp Turbo Right Foot Ascender (ASC190-R), Sterling RIT 9mm Eye-to-Eye Prusik (CLI339), DMM XSRE carabiner (CAR318 - colors may vary), Petzl Torse strap (SAD405), Delta Link (HAR117). The RADS (Rapid Ascent/Descent System) kit is a simple single rope system which allows the user to easily ascend a single rope with mechanical advantage. With the Petzl Rig installed, the climber is always ready to descend simply by removing the handled ascender, switching from ascent to descent quickly and with minimal fuss. Kit contains: Petzl Basic Ascender, 1/4" Delta Link, Revolver Carabiner, Foot Strap, RockO Carabiner, Petzl Rig. The simplest canopy-entry method lets the climber ascender with a simple sit-stand motion. The daisy chains is used as an adjustable tethers the pair of hand ascenders, and one for the pair of foot straps. Kit contains CMI Expedition ascenders x 2 (left/right), RockO Carabiners x 2, Ascender foot straps x 2, Delta links x 2, and 1 x 54" daisy chain.